Every spring, the Ganges River swells with water as snow melts in the Himalayas. The water brings life as trees and flowers bloom and crops grow. This cycle of rebirth is a metaphor for Hinduism, the religious faith of most people in India. Hindus believe that every living thing has a soul, which comes from the creator, Brahman. They believe that people’s souls live on after death, and that all living things can be reborn. This is called reincarnation. Hinduism is the traditional religion of India. It is a combination of Aryan, Dravidian and other Indian cultures and traditions. Hinduism has no single founder but is influenced by the Vedas and other scriptures. The world’s oldest religion, Hinduism is practiced by nearly one billion people, who live almost exclusively on the Indian subcontinent. Hinduism teaches that there is one universal spirit called Brahman. But Hindus seldom worship Brahman directly. They instead worship Brahma, Vishnu, and Shiva, three gods that are different forms of Brahman. Brahma is the god of knowledge and the creator of the universe whose work is almost complete. 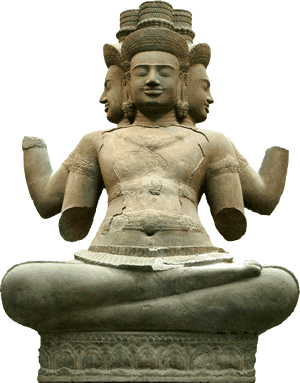 Brahma is often pictured with four heads facing in different directions. Vishnu is the preserver of the universe who protects us from evil. Hindus believe that Vishnu often takes on human forms called avatars, so he can guide all living things. Shiva is the god of destruction and re-creation. Shiva represents change, from day to night, across the seasons, and throughout our lives. 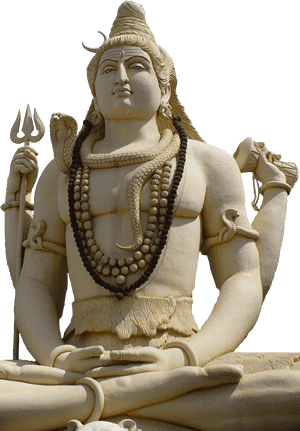 Shiva is often depicted as having four arms, which represent the different directions we can take in life. Many Hindus believe that our status in this life depends upon the karma that human beings accumulate in previous lives. Karma can be defined as the rewards or punishments a person faces because of their thoughts, words, and actions. A happy person who treats others with kindness and respect creates good karma. Likewise, a person who mistreats others will, in turn, be mistreated. This is bad karma. Traditionally, the people of the subcontinent believed that a person who followed the rules of their caste would be reborn as a higher form in the next life. Someone who neglected their duties would be reborn in a lower form of life, perhaps as an animal or insect. The goal of Hinduism is to escape the cycle of rebirth by reaching nirvana. Nirvana is a Sanskrit word that means ending. Hindus and Buddhists believe nirvana is a state of happiness without change or pain. Because they believe all living things have souls, most Hindus are vegetarians; they believe that animals should live their natural lives and should not be killed for food. Some Hindus are vegan, which means they will not eat any animal products, including eggs and cheese. Other Hindus will eat poultry and fish, but will not eat beef. Cows are particularly sacred to Hindus because they are associated with Brahma; it is not unusual to see a cow wandering through the streets of an Indian city. Many Hindus worship privately by performing rituals known as puja at a shrine in their homes. A Hindu may practice yoga, a system of exercise and meditation that teaches the practitioner mastery of their mind, body, and emotions. There are Hindu temples (mandirs) and holy locations, but there are no set rules for worship. A guru is a spiritual teacher who understands dharma, the spiritual laws that govern the universe. Many Hindus are loyal to their gurus because they regard the gurus as representatives of Brahma who can help them escape the cycle of death and rebirth. Hindus believe that water is holy because water brings life, particularly if the water is flowing in a river. The holiest of rivers is the Ganges River. Lately, the Ganges has become very polluted, but Hindus believe the water from the Himalayas will purify the souls of those who drink or bathe in its waters. Many Hindus make a pilgrimage to the Ganges. Others travel to the river at the end of their lives so they may die near the banks of the Ganges. Download a Powerpoint Presentation on this lesson. Mr. Donn has an excellent website that includes a section on India. 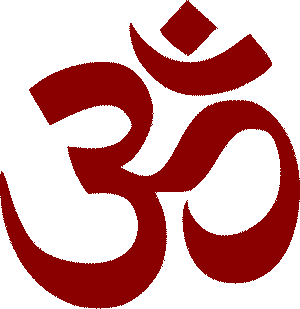 Aum is a mystical symbol and sound prominent in the Hindu religion. Hindus often intone the aum at the beginning and the end of a mantra, or prayer. Brahma is the god of knowledge and the creator of the universe whose work is almost complete. 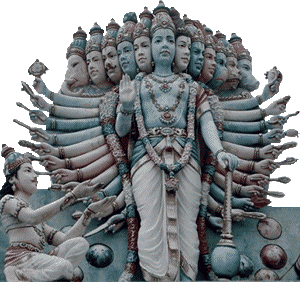 Brahma is often pictured with four heads facing in different directions. Vishnu is the preserver of the universe who protects us from evil. Hindus believe that Vishnu often takes on human forms called avatars, so he can guide all living things. Shiva is the god of destruction and re-creation. Shiva represents change, from day to night, across the seasons, and throughout our lives. Shiva is often depicted as having four arms, which represent the different directions we can take in life. 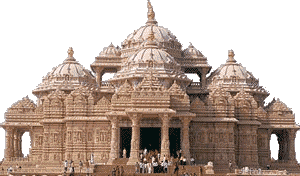 Akshardham is a Hindu temple complex in Delhi, India. This entry was posted in India and The Himalayas. Bookmark the permalink.